Scallops and shrimp over grits. I have been involved in the aquaculture industry since the late 1980’s when I got my first job out of college on a tropical fish farm in Plant City, FL. As you can imagine, the industry has changed a lot since then. When folks find out I have worked in aquaculture, the same question seems to arise: “Is farm-raised fish safe to eat as wild caught?” I would like to say that I don’t understand where this question comes from, but over the years I have seen a bewildering number of mass media headlines touting misinformation about farm-raised fish and not enough touting the benefits. In fact, I saw a post this week on Facebook actually claiming that tilapia have no skin or bones and cannot be found in the wild, both not true. It is no wonder people are so confused. Many of the claims made are not research-based and a quick review of the scientific literature will disprove the statements, but who has time for that? Aquaculture currently supplies over fifty percent of all seafood consumed and will expand in the future due to a limit on the amount of wild fish that can be sustainably harvested, and increasing demand by a growing population. Sustainable, responsible aquaculture is needed to fill that gap. Fish are farmed using a variety of production methods including ponds, raceways, recirculating land-based systems and in ocean net pens. Each one of these fish species and production methods comes with pros and cons, similar to the production of livestock and fruits and vegetables. Each species can be evaluated based on its environmental impact, production method and even country of origin. The American Heart Foundation recommends eating fish (particularly fatty fish rich in Omega-3s) two times per week. We currently only consume about half of that. This recommendation includes a variety of farm-raised and wild-caught fish. Both are crucial to meet current and future demand for seafood and omega-3 fatty acids. A common misconception is that farmed fish is not as healthy or nutritional valuable as wild caught fish although this claim has been largely disproven. One recent paper (Trushenski et al, 2017) compared the nutritional values of wild-caught and farmed bluegill, largemouth Bass and hybrid striped bass and concluded that the farmed fish provided more long-chain polyunsaturated fatty acids (LC-PUFAs) per portion that wild fish, however both are excellent sources of high quality protein and nutrients. With the Lenten season upon us, a time of a traditional increase in seafood consumption, what is an easy way to choose wild and farm-raised seafood? 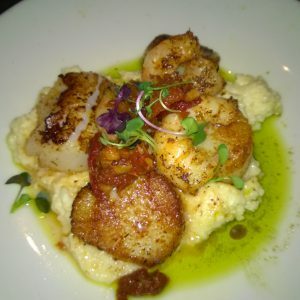 One website and smartphone app that I find easy to use is Seafood Watch (www.seafoodwatch.org). Seafood Watch uses an extensive evaluation system using research and a panel of experts to label seafood products as green (best choice), yellow (good alternative) and red (avoid) depending on the variety’s sustainability. With this information and a little bit of homework, I hope you come to the same conclusion that I have. Both farm-raised fish and wild-caught fish are delicious, nutritious and great additions to your diet. 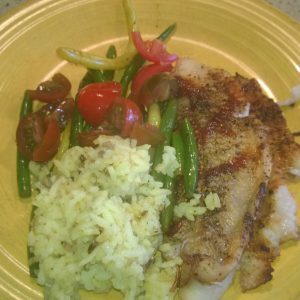 Baked tilapia, rice and vegetable medley.